Metro Woman is a resource magazine informing women about businesses offering the products and services they need for their always-changing lifestyle. It is a full-color magazine with durable, high-gloss paper that will keep your interest with its simple format. Plus, with the handy size of Metro Woman you can easily keep it with you in your purse or glove box. You'll find Metro Woman in pinpoint locations frequented by women. Our readers think of us as a lifeline to finding what they need--our advertisers think of us as a solid investment to increase their business! 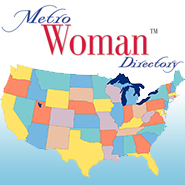 Select your area from the left side of this page to find a Metro Woman near you. Contact us if your area does not have a directory and you have sales experience; become a publisher and own your own business. Join others we have guided with our proprietary publishing information. "We have been thrilled with the response we have gotten from advertising with Metro Woman. The calls from the ad have been from very high quality potential customers. The closing rate of turning these women into clients has been phenomenal. We highly recommend them."